The Roland Demora Modular Delay is a fantastically versatile unit for the AIRA range but also suitable for DJs, guitarists and keyboard play.. The Roland Demora Modular Delay is a fantastically versatile unit for the AIRA range but also suitable for DJs, guitarists and keyboard players - and Re-programmable via Mac, PC, iOS, Android application. Demora is an all new delay algorithm with a smooth, creamy sound and quick response that is as fun to tweak as it is to hear. With the massive range of delay times and buffer hold function you can create anything from ultra-subtle widening to dramatic rhythmic effects. Using the large comfortable controls or standard ” patch cables, you can independently control the delay time, feedback, width, wet/dry signal, delay hold and signal bypass. Both the delay time and feedback parameters have input level controls for adjusting the modulation range when controlled from an external source. 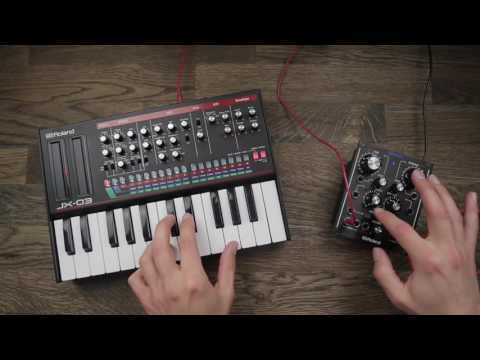 Two inputs and two outputs make Demora a stereo-capable, 24bit/96kHz audio interface for Eurorack systems and AIRA Link USB compatibility gives it single-cable, plug and play connectivity with the MX-1 Mix Performer. While it sounds great out of the box, you can fully customize Demora’s internal signal path by re-patching its array of virtual sub-modules via a custom application that works on Mac and PC as well as iOS and Android devices. Submodules are re-patched through a simple and intuitive drag and drop interface that even lets you choose which parameters are assigned to the high-resolution “GRF” knobs. You can reprogram Demora in realtime via USB connection or save and recall patches with a simple audio signal. You can even share patches with other Demora users. Carefully crafted in Japan, Demora has large, ultra-smooth controls with over 16 million steps of resolution and is fully re-programmable via computer, smartphone or tablet.